1.Australia is the 6th largest country by total area. 3.Australia is believed to be inhibited by humans for at least 40000 years. 4.The first Europeans to discover Australia were the Dutch. 5.Captain Arthur Phillip led the First Fleet into Port Jackson on 26 January 1788. This date became Australia’s national day, Australia Day. 6.In 1835 John Batman negotiated a treaty (now known as Batman’s Treaty but also known as the Dutigulla Treaty, Dutigulla Deed, Melbourne Treaty or Melbourne Deed), with some local Aborigines to rent their land on an annual basis for 40 blankets, 30 axes, 100 knives, 50 scissors, 30 mirrors, 200 handkerchiefs, 100 pounds of flour and 6 shirts. It is unlikely that the Wurundjeri people would have understood this transfer of land or agreed to it if they had, but, as Percival Serle wrote, “No doubt the blankets, knives, tomahawks, etc., that he gave them were very welcome”. In any case, Governor Bourke deemed such a treaty invalid as the land was claimed by the Crown rather than the Aborigines and other colonists including the rival party of John Pascoe Fawkner arrived to settle Melbourne. 8.When Europeans settled Australia after 1788 the Aboriginal population declined from an estimated 300,000 (or possibly up to one million) people down to 120,000 by the 1920s. There is agreement about one fact: less than 10% of this dramatic decline following European settlement was caused by deliberate acts such as shooting or poisoning. Most deaths were caused by disease. Deaths were also caused by the loss of hunting grounds due to sheep and cattle grazing. Separate colonies were carved from parts of New South Wales: South Australia in 1836, Victoria in 1851, and Queensland in 1859. The Northern Territory was founded in 1911 when it was excised from South Australia. South Australia was founded as a “free province”—it was never a penal colony. 10.Australia has six states—New South Wales, Queensland, South Australia, Tasmania, Victoria, and Western Australia—and two major mainland territories—the Northern Territory and the Australian Capital Territory (ACT). In most respects these two territories function as states, but the Commonwealth Parliament can override any legislation of their parliaments. 12.Because Sydney and Melbourne kept bickering over which city should be the capital of Australia, it was decided that neither of them would be capital and instead, a new capital would be built in the middle of them both. 13.It was estimated in 2007 that 22 per cent of Australians had a convict ancestor. 14.The current population of Australia is 22.7 million. 17.Australia is the world’s 13th-largest economy and has the world’s sixth-highest per capita income. 18.“Advance Australia Fair” is the official national anthem of Australia. Created by the Scottish-born composer, Peter Dodds McCormick, the song was first performed in 1878, but did not gain its status as the official anthem until 1984. Until 1974 God Save the Queen was Australia’s national anthem. In 1973 the Whitlam government decided that the country needed an anthem that could represent Australia with “distinction” and started a competition to find one. The contest ended with the suggestions for Advance Australia Fair, Waltzing Matilda and Song of Australia. In January 1976 the Fraser government reinstated God Save the Queen for royal, vice-regal, defence, and loyal toast occasions. Advance Australia Fair, with modified lyrics from the original was adopted as the Australian national anthem on 19 April 1984. 20.The Kangaroo and the Emu were chosen to feature on the Australian Coat of Arms because they are incapable of walking backwards and therefore symbolise a nation moving forward. 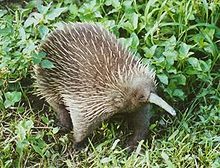 21.The Australian platypus and echidna are the only mammals (monotremes) to lay eggs. 22.Horrible tasting bread spread Vegemite is loved by most Australians. Vegemite is made from used brewers’ yeast extract, a by-product of beer manufacturing, various vegetables, and wheat and spice additives. It is salty, slightly bitter, and umami or malty. 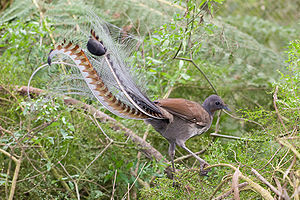 23.The Australian Lyre Bird is the world’s best imitator; able to mimic the calls of 15 different species of birds in their locality and string the calls into a melody. Also been known to mimic the sound mobile phones. 24.The Fierce Snake or Inland Taipan has the most toxic venom of any snake. Maximum yield recorded (for one bite) is 110mg. That would probably be enough to kill over 100 people or 250,000 mice. 25.The box jellyfish is considered the world’s most venomous marine creature. The box jellyfish has killed more people in Australia than stonefish, sharks and crocodiles combined. 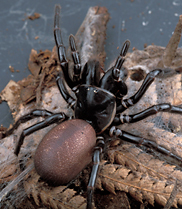 26.The Sydney Funnelweb spider is considered the world’s most deadly spider. It is the only spider that has killed people in less than 2 hours. Its fangs are powerful enough to bite through gloves and fingernails. The only animals without immunity to the funnelweb’s venom are humans and monkeys. 27.POME – Australians refer to English people as Poms or Pome. This is an acronym for Prisoners of Mother England. May have originally been an abbreviation for pomegranate which is Convict rhyming slang for immigrant. 28.Australians may refer to Americans as ‘Seppos’. This is an abbreviation for ‘Septic Tank’ which is rhyming slang for ‘Yank’.